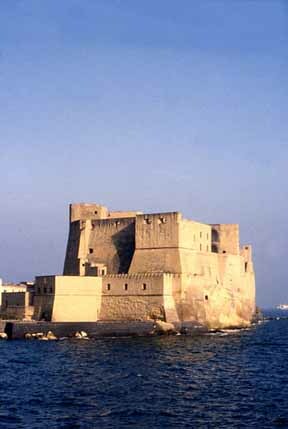 It is the stuff of which fairy tales are made, but ours was a real princess and the castle is that old medieval fortress, Castel dell'Ovo, or the Egg Castle, that you see as you sail into the harbor of Naples or pass as you drive by the Santa Lucia area of the the city. loathed and feared him almost as much as they had his father. Although they both spent much of their time trying either to placate or intimidate successive Popes, they usually ended up being excommunicated once more. Finally, the French Pope, Clement IV, talked the French King into letting his ambitious brother, Charles of Anjou, invade Italy. Charles not only received the Papal blessing --and the Papal armed forces-- but was also anointed as the feudal ruler of Sicily and all of Southern Italy. In 1266, at Benevento, during a fierce battle between the two armies, King Manfred was killed and the Angevins were victorious. Meanwhile, Manfred's daughter, 6-year old Princess Beatrice, and her mother, Helen of Epirus, along with her three little brothers, were staying in the castle of Lucera in Apulia, protected by their faithful Saracen guards. Queen Helena, who had good cause not to trust the local barons, as they had proven so treacherous to her husband's cause, knew they were in danger. So, with her four young children she fled to Trani on the Adriatic coast, to the very castle where not so many years before she had become the bride of King Manfred amidst the pomp and splendor of a royal wedding. Knowing that Charles and his spies were searching for her and her children, especially the male heirs of the Norman/Swabian Kingdom, Helena, panic-stricken and desperate, took refuge in that same castle until she could find a ship to take them all to Epirus, her homeland in Greece. They finally set sail despite a terrible storm, but the winds were too fierce and they were driven back upon the shores of Trani. Once more they took refuge in the castle and it was there that they were soon captured by the soldiers sent by Charles of Anjou. Princess Beatrice and her mother were sent across the country to the castle of Nocera and were held prisoner in that fortress. The three little princes were taken to the nearby Castel del Monte, the handsome octagonal castle in Apulia that had been the pride and joy of their grandfather, Frederick II. There they stayed, often chained up like animals, for over 25 years. (But theirs is another story --and one without a happy ending). Charles, the new Angevin king, now ensconced in his new capital of Naples, was anxious to legitimize his rule, first by getting rid of the opposition. So, after chopping off the head of another of Frederick's grandsons, 16 year old Conradin, in the Piazza del Mercato in the middle of Naples, he encouraged the rumors that the three young sons of Manfred had all died. Beatrice, the young princess may still have been with her mother, Helena, in Nocera where, after five years in prison, not knowing the fate of her little sons, Helena died --many said-- of a broken heart. We do know that shortly after her mother's death, in 1292 Beatrice was imprisoned in the then not-so-old Egg Castle. And there our beautiful princess stayed all through her growing-up years. She must have been very beautiful if she looked at all like her parents, for the chronicles write of her father being a handsome, fair and charming prince, and of her mother as being the beautiful Helena, daughter of the despot of Epirus. Since news, good and news, always gets around, even in castles, our princess must have rejoiced when she heard that the Sicilians had rebelled and massacred every hated Frenchman they could lay their hands on. Even better news came when the Sicilians invited Beatrice's big sister, Constance, (Manfred's daughter by his first wife) and her Spanish husband, Peter III of Aragon, to become their queen and king. If the War of the Sicilian Vespers hadn't broken out, or if the Aragonese side hadn't had such a splendidly successful admiral, Roger of Lauria, our princess might have spent the rest of her life in that formidable Egg. Beatrice, herself, must have given up hope during her long years of imprisonment..
One day in 1284, Beatrice, perhaps gazing out of her window, must have been thrilled to see the sails of the Sicilian fleet coming ever closer, finally daring to anchor under the walls of her prison. While Roger, the admiral, didn't stay long in Naples, he fulfilled his queen's desire to rescue her younger sister. Thus, when he set sail for Sicily, Beatrice was with him. After 18 years in prison, to sail away free at last from the Egg into the tender arms of her sister waiting in Palermo must have seemed to her like a fairy tale come true. Princess Beatrice even found her prince, or, at least, her marchese, for very shortly, at age 24, she married Manfredi, Marquis of Saluzzo. . . .and, of course, they lived happily ever after.